Superbly French from the wonderfully stylish "Belle Epoche" period. This mastercrafted brooch/pendant is in the style of George Fouquet. A beautifully cut diamond is held in the mouth of an 18ct yellow gold "griffin", surrounded by a complex pierced platinum border set with smaller diamonds. 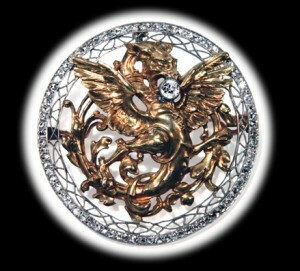 Can be worn as a brooch or a pendant.